Dr. László Lénárd born in October 26, 1944, in Pécs, Hungary received MD degree in 1969 (Pécs University Medical School). His research field includes neurophysiology and behavioral sciences. He received Candidate (PhD) degree in 1980, and DMSc in 1989. He was elected as corresponding member (2001) than as full member (2007) of the Hungarian Academy of Sciences (HAS). 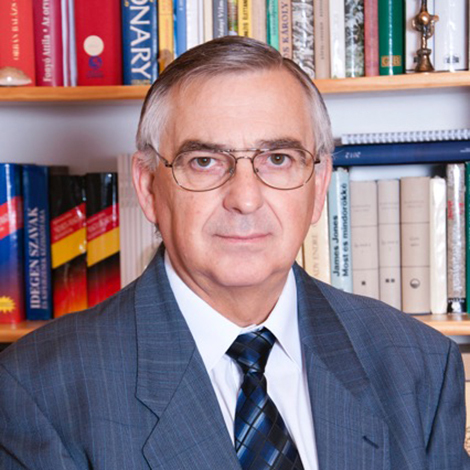 He has been professor since 1990, chairman at the Institute of Physiology, Pécs University Medical School (1990-2009) and director of the Neurophysilogy Research Group of the HAS (1990-2012). He was vice-rector (1997-2001), dean of the Medical School (2002-2003) than rector (president) of the Pécs University (2003-2007). He was the president of the Neurobiology Committee of the HAS, the vice-president of the Hungarian Physiological Society and president of the Hungarian Neuroscience Society. He was the Eurasian representative and the president of the IBNS, member of the Governing Council of the IBRO, president of the IUPS Food and Water Intake Commission and he is the member of the Executive Committee of the IUBS. He has been on the editorial board of 5 international journals. He was awarded by IBNS Fellow Award, Szentágothai Price, Széchenyi Professor Fellowship, Grastyán Award, Pro Facultate Medicinae and Pro Universitate Quiqueecclesiensi dedications. In 2011 the Prime Minister and the President of Hungary dedicated him by the Széchenyi Award. In 2005 he was elected as the Honorary Member of the Russian Medical Academy and he received the Meyers Lifetime Achievement Award in Behavioral Neurosciences in the USA. He organized numerous scientific congresses in Hungary and abroad, and conducted collaborative research with well respected English, German, French, Japanese and American scientists. His research activities aimed to unravel neurochemical and electrophysiological mechanisms of motivation, learning and body weight regulation. He disclosed the role of dopamine in perceptual processes, and showed the functional significance of the balancing role of dopamine and norepinephrine systems in body weight regulation. By means of the first description of amphetamine self-injection into the brain of rats he opened a new research direction to study mechanisms of reinforcement and addiction. He described in the limbic system the importance of opiate, catecholamine and acetylcholine mechanisms in rewarding-reinforcing processes. He discovered glucose-sensitive neurons in different limbic structures and described their functional significance. He elaborated a new, coherent hypothesis of feeding regulation. In this theory the key-element is the hierarchically organized glucose-analyzing network integrating visceral, endogenous neurochemical, taste- and odor-related information responsible for development of hunger motivation. He contributed to the better understanding of peptidergic regulation of satiety, taste aversion learning and taste related information processing in the frontal lobe. In human neuropsychological investigations he verified the addictive role of feeding in obesity and he disclosed characteristic changes of cognitive and emotional achievements of obese and anorexic patients. His students are successful researchers in Hungary, Western Europe and in the USA.